Cycling Team Defends American Chris Horner After Win In Spain : The Two-Way Conjecture over Chris Horner, the 41-year-old American who won Spain's Vuelta bike race on Sunday, grew after drug testers couldn't find him at a team hotel Monday morning. 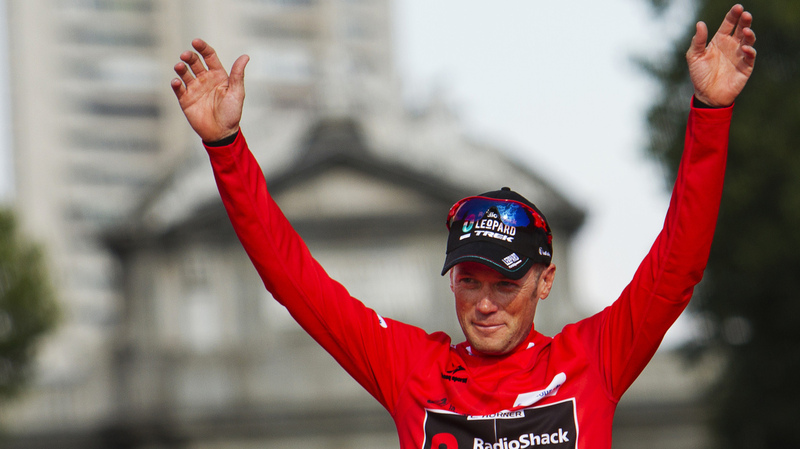 American cyclist Chris Horner celebrates winning Spain's Vuelta bicycle race Sunday. Anti-doping officials say that Horner, who at 41 is the oldest ever to win one of cycling's top events, was not at the hotel drug testers visited. The cycling team of Chris Horner, the 41-year-old American who won Spain's Vuelta bike race on Sunday, says the racer followed the rules in telling doping officials where they could test him. And Monday afternoon, U.S. doping officials agreed that Horner had done his part to allow surprise out-of-competition testing. Conjecture over Horner's victory in the three-week Vuelta a Espana grew after drug testers couldn't find him at a team hotel in Madrid on Monday morning. His team says the officials went to the wrong hotel. Horner will turn 42 next month, making him by several years the oldest rider ever to win a Grand Tour event, the centerpiece races on the European circuit. He is now believed to be on his way back to his home in Bend, Ore. The team's defense of Horner — and its posting of an email thread in which Horner informed U.S. Anti-Doping Agency officials of his planned whereabouts on Monday and the rest of the week — has brought a response from USADA, which says it won't hold the mix-up against Horner. USADA says that, "given that the information was received in the U.S., the AEA doping control officer on the ground in Spain did not receive the updated information prior to arriving at the hotel." The agency also said that doping officials had not leaked information to the media. A climbing specialist who is a former teammate of Lance Armstrong, Horner is known for maintaining a smile on his face during long, punishing climbs. Sunday's win in the Vuelta is the biggest of his career. During its coverage of the race, Spanish newspapers have taken to calling Horner "El Abuelo" — the grandfather, NPR's Lauren Frayer tells us from Madrid. Horner's team, RadioShack Leopard Trek, issued a statement today declaring that anti-doping officials had violated the cyclist's privacy if they informed the media that Horner wasn't at the hotel that drug testers visited this morning. "The anti-doping inspectors from the Spanish Anti-doping Agency that were asked to do the test by the United States Anti-Doping Agency (USADA) showed up at the wrong hotel in Madrid, where the team was staying but Horner was obviously not to be found. "The team believes the communication between the Spanish Anti-doping Agency and the media is a violation of the privacy of Chris Horner, especially since it comes down to a clear mistake by the tester." Their statement ended with the news that RadioShack Leopard Trek "will seek compensation for this matter with the responsible anti-doping agencies." The team has said that Horner's performance, particularly his power output in a mountain stage last week that raised eyebrows, isn't out of the ordinary for an elite cyclist who weighs around 140 pounds. And his defenders note that Horner did not ride in this year's other big European races, the Tour de France and the Giro d'Italia. In addition, two factors at this year's Vuelta helped him: a strong ride in the time trial by his team, and the race route's inclusion of 13 mountain stages, out of 21 total. In an article for Velo News analyzing the skepticism over Horner's performance, Andrew Hood says that USADA's detailed report on years of cheating in the sport have "erased any doubt about how riders used to win grand tours. What remains is the doubt in believing what we are seeing." "It's a shame for Horner, and for cycling, that his victory cannot be wholly embraced, but that's the reality of today's peloton. Riders have to realize that after winning the race, they must then be ready to convince everyone that they can believe it. Fans simply do not want to be taken for fools again."